Everybody's America reassesses Pynchon's literary career in order to explain the central role played by the racialization of American culture in the postmodernist deconstruction of subjectivity and literary authority and in the crisis in white liberal culture. It charts the evolution of both these cultural transformations from Pynchon's early short stories, composed in the late 1950s, through Gravity's Rainbow, published in 1973. 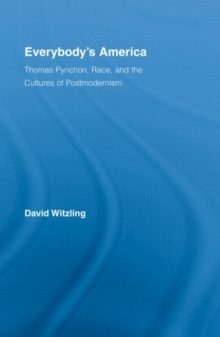 This book demonstrates that Pynchon deploys techniques associated with the decentering of the linguistic sign and the fragmentation of narrative in order to work through the anxieties of white male subjects in their encounter with racial otherness. It also charts Pynchon's attention to non-white and non-Euro-American voices and cultural forms, which imply an awareness of and interest in processes of transculturation occurring both within U.S. borders and between the U.S. and the Third World. In these ways, his novels attempt to acknowledge the implicit racism in many elements of white American culture and to grapple with the psychological and sociopolitical effects of that racism on both white and black Americans. The argument of Everybody's America, however, also considers the limits of Pynchon's implicit commitment to hybridity as a social ideal, identifying attitudes expressed in his work that suggest a residual attraction to the mainstream liberalism of the fifties and early sixties. Pynchon's fiction dramatizes the conflict between the discourses and values of such liberalism and those of an emergent multiculturalist ethos that names and valorizes social difference and hybridity. In identifying the competition between residual liberalism and an emergent multiculturalism, Everybody's America makes its contribution to the broader understanding of postmodern culture.